We are envious of your Thanksgiving on your boat. We did have family around, which as you say, is a real blessing. Marin had a warm blanket in front of the pellet stove and Grandchildren to spoil him.In that spirit, Elaine and I hope you continue to have a blessed and bountiful life filled with your families and all that love and hold dear. Glad to hear the "four" of you had a great Thanksgiving on the boat. Sorry to hear about your family situations. Our prayers are with you. We spent the day on the boat with a little exploring on Half Note in the afternoon. The kids and us. We wouldn't have it any other way. 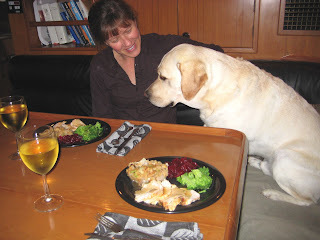 Hey Dylan, if you stare just a little harder at that dinner plate it will levitate and move towards your mouth. Just stare a little harder! After the parade, did the kids watch the dog show on TV? I always wonder whether those dog-show dogs ever get to romp on a beach. Karen, that's quite something that your folks have been together over 60 years. Definitely something to be thankful for. Looks like a pretty good thanksgiving meal for being on a boat. I'm sure somebody is developing a new turkey with a cube-shaped body that will fit into your boat's oven. Thanks for all the comments - we surely hope everyone had a happy and healthy Thanksgiving too. Yes, we watched the dog show. Dylan actually watches TV on things like that. He likes seeing the dogs on the screen - it's quite funny to watch. Turkey breast instead of turkey !! It is amazing the completely unique experiencies we have on the boat.